Found this Burny LP on a local (Swedish) fleabay equivalent, got a pretty good price on it and it turned out to be the best LP I've had so far. Pretty flametop, great player, brilliant open PAF-like sound from the pups. In short: it makes you wanna play "All Right Now" real bad. AND it came with an original, Burny-branded HSC. So far, so good. But then, there are the eternal questions "exactly what?" and "at least approximately when?". 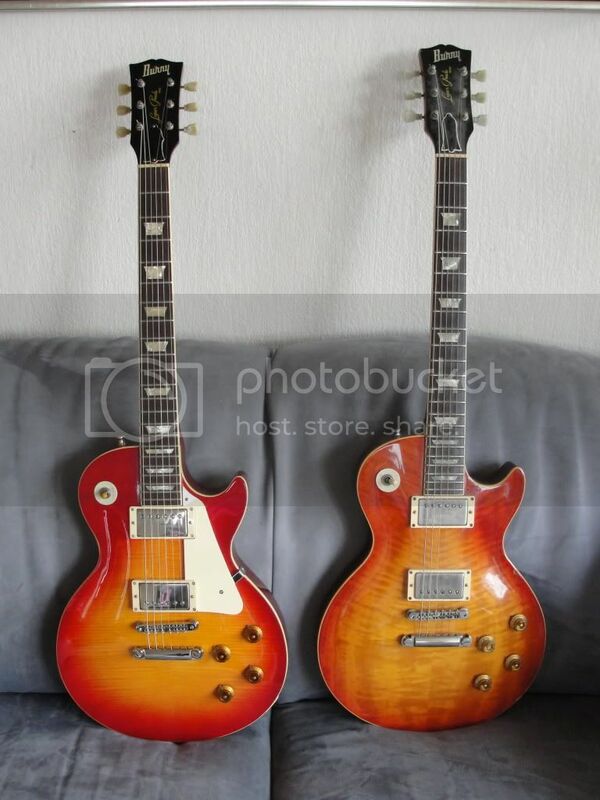 The seller, who seemed to be honest and in possession of roughly the same half-assed amount of knowledge of MIJ lore as myself labeled it "an early to mid 80's RLG-90 with L8001/8002 pickups". Some of the evidence seems to bear it out, some seems less than conclusive. Sorry for the inconvenience, but there are a lot of large pics, and I've failed embedding photos here before, so please bear with me. "Luper Prade" decal in a fairly low position, with "Model" slightly higher than the lower edge of the G string tree. I would be very grateful for any input from the esteemed and informed members of this forum. PS I managed to move the pic folder, thus killing the original link. Fixed now. Thanks for the info, it doesn't seem too far off the mark then. I wondered about the "early - mid 80's" timeline myself, the "wavy" rear route and the 90 degree pointers seem to contradict that. Ah well, gotta love Burnys, they sure keep you guessing. Which is half the fun. Anyway, great guitar! Thx again. That's 100% sure a 1987 RLG-90. Dyna made and with VH-1 pickups. @jacco: Don't worry, it's already mine, mine, MINE! And thanks for giving me the factory, that was my next question. Is that VH1 as in 1st generation VH1? As I understand it, later VH1's were essentially re-labeled VH2/4's? @otto: wow, spectacular guitars, love the smiley face top on the FLG. Otto, your RLG-90 is also from 1987, right? Do you have pics of the interiors? @otto: I see your RLG has the xmas tree TRC, while mine has the bell? Was '87 the year of changeover, or was there a tree on mine as well originally, do you think? No problem mate and HNGD!! No, that's 2nd generation VH1,1st generation = 1983-84 (VERY rare), second generation 1985-1989. 3rd & 4th I have not quite clear yet but 3rd is roughly from 1990 to 1994, 4th after that. I don't know about the relabelled VH2/4 but do understand why people think that. LG-75s had orighinally VH4s but were later fitted with VH1s. That's arouund when the 4th gen was introduced, which are Gotoh's btw. No, if Otto's is from 1987, the TRC is non original. Winged TRCs were introduced april 1989. I already found yours Otto. And what's very interesting is that the length of the polescrews on yours Otto are way shorter than the ones on Hans' RLG-90. Do you have any means to measure your pickups resistence Hans?